If you're one of the more than 26 million people in the U.S. with diabetes, you know first hand how the disease impacts your life. That includes your dental health — and whether or not implants are a good tooth replacement option for you. Diabetes is actually the name for a group of diseases affecting how your body processes glucose, a simple sugar that provides energy for the body's cells. The level of glucose in the blood is regulated by insulin, a hormone produced in the pancreas. Diabetes causes the pancreas to either stop producing insulin (Type 1) or not produce enough (Type 2). Also in Type 2, the body can become unresponsive to the insulin produced. The implications for either type are serious and can be life-threatening. If glucose levels are chronically too low or high the patient could eventually go blind, suffer nerve damage, or develop kidney disease. Diabetes also interferes with wound healing and creates a greater susceptibility for gangrene: diabetics thus have a higher risk for losing fingers, toes and limbs, and can even succumb to coma or death. 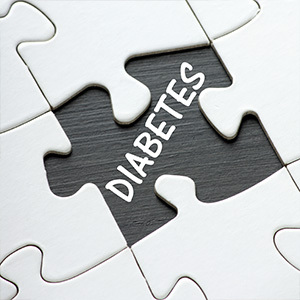 Type 2 is the most common form of diabetes. Fortunately, most people with this type can effectively manage it through diet, exercise and regular glucose monitoring; if need be, prescription medication can help regulate their levels. Even so, diabetics with their disease under control must still be alert to slower wound healing and a higher risk of infection. Because implant placement is a minor surgical procedure, the aspects of diabetes related to healing, infection and inflammation could have an adverse impact on the ultimate success of the placement. Implant surgery creates a wound in the surrounding gum tissues and bone that will need to heal; the body's immune response in a diabetic can interfere with that process. And if infection sets in, the risks of implant failure increase. But research has shown that diabetics with good glucose management have as high a success rate (over 95% after ten years) as non-diabetic patients. That means the implant option is a viable one for you as a diabetic — but only if you have your disease under control. If you would like more information on the relationship between dental implants and other health conditions, please contact us or schedule an appointment for a consultation.